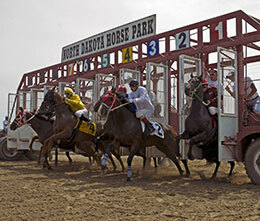 North Dakota Horse Park hosted the $10,000 NDHP/AQHA Bonus Challenge for older Challenge enrolled horses on Saturday's race card. FARGO, ND�JULY 30, 2016�Catcha Breeze, under jockey Jordan Olesiak, got up at the wire to defeat Quick Thrill by a nose Saturday afternoon in the $10,000 North Dakota Horse Park AQHA Bonus Challenge (not black type). Charged Up Corona finished half-a-length back to get third. Racing for owners Randy and Sharlene Reuer Catcha Breeze raced over the 440-yard course in :22.524 seconds to pocket the winner's paycheck of $5,000, boosting her total earnings mark to $15,431. It was the second career win in 13 starts for the Texas bred daughter of multiple stakes sire IVORY JAMES. Sharlene also trains the brown filly out of Jessy Jane, by Mr Jess Perry. B/M Eiland and Harris Racing Stable, Inc. is the breeder. Quick Thrill races for owner/trainer Donald Dolphus Jr. Terry Bennett was aboard the Evans and Evans Texas bred gelding. He earned $2,000. Tyler Stein's Charged Up Corona picked up $1,200 for his third place effort. Craig Stein trains and Jeramie Fennel was aboard the gelding. Jean Dillard is the breeder. Ja Gols Obession, Chicks Skidoo and Jumpn The Moon completed the field.